In recent years we have worked with over one thousand children. Together we have planted orchards, often with rare Sussex apple varieties, cooked and juiced apples in schools, housing estates, parks and village recreation grounds across Sussex. Inspired by these experiences, we created the children’s book Our Apple Orchards with our partners Action in rural Sussex. The book aims to encourage children to grow, eat and enjoy local fruit. The paperback version is available from us for £3 plus £1.50 p&p. Contact us to place your order! You can also download a free digital version, which we encourage you to download for your own use. Please share the link to this page with your friends. Our only requirement is that you do not distribute or modify the file. If you would like to work with us to plant an orchard for your school or community, visit our Community orchards page to see how we can assist. 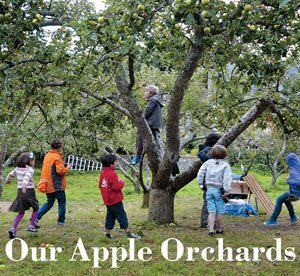 There, you can sign up to our Community orchards mailing list to receive periodic emails about how Brighton Permaculture Trust and its partners can support community and school orchards in Sussex. For insights into our local Sussex orchard history and possible future, we recommend Apples & Orchards in Sussex by Brian Short, et. al. (2012).